We’ve added a new object to CObjectLayer, it is a generic mesh. So, now you can mix sprites, texts and generic meshes in the same layer. In addition, a mesh can be composed by submeshes, and you can assign different ways of rendering for each submesh: Points, Lines, LineStrip, LineLoop, Triangles, TriangleStrip and TriangleFan. These meshes are fully editable and you can add and modify at any time: VertexPosition, VertexColor, VertexTextureCoords, VertexNormal. Finally, tell that the user can add VertexIndexes if the mesh is not linear. Otherwise, it behaves like an ordinary sprite. We finally have web. We hope you enjoy the design! The web is available on english and spanish. We look forward to reading your reviews, comments and suggestions. We redesign LittleGame’s interface following some feedback from users. We expect you like it. 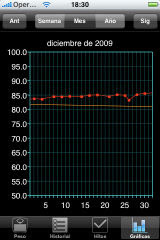 Now we have done the micro-site for our first app WeightControl. I hope you enjoy it! Currently is available in English, French and Spanish. This time is not a game. There were several companies asking us if we are able to do iPhone apps, and then we make this one. WeightControl is an application to track your weight visually, making it the perfect complement for people starting a diet or sportmen who want to grow their muscular mass. 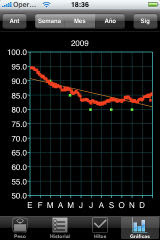 WeightControl is designed for people who want to gain or lose weight, or just want to keep track of this. Thanks to the historical weight measurements you will see your progress, for weeks, months or years, easily graphically and can also observe the trend of your weight in certain moments in history. 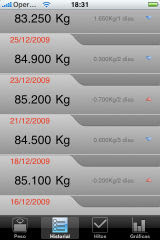 You can also view your weighing in a list, where you can watch the progress of your weight over time. Another interesting aspect is the application that lets you define milestones to help motivate you to reach your ideal weight. 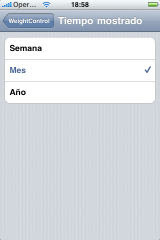 Finally, the units of measurement and targets can be easily changed in the application preferences.